Lori Cuellar, left, is posing with her daughter, Renee Cuellar, right. Lori Cuellar, a Miami resident, survived basal cell carcinoma. Here she is sporting one of her four looks for the "Wear To Now" photoshoot. The blog will feature her in June. 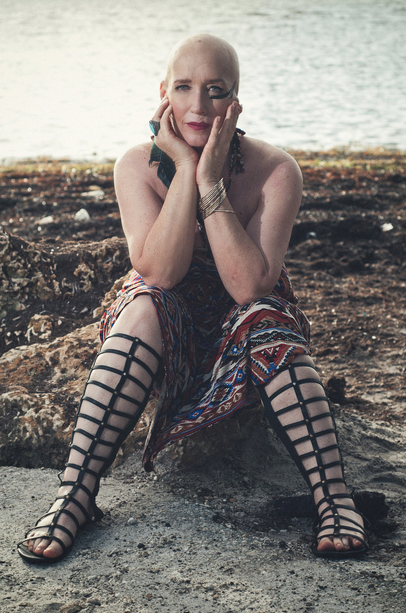 The 51-year-old wore a halter dress with tribal prints that fell to the ground, covered with seaweed. Black horizontal lines were painted on her face to complete the fierce look. A large blue-and-green feather earring hung from her left earlobe. Cuellar is missing the top half of that ear. "I let a scab on my ear go for several years without anything being done to it, so I ended up losing the better portion of an ear to skin cancer," she says. The Miami resident was diagnosed with basal cell carcinoma about seven years ago. 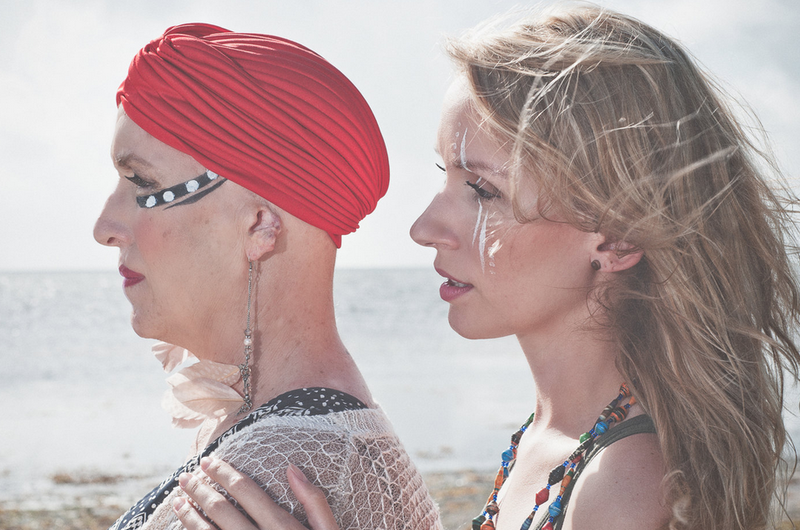 She’s the sixth local cancer survivor featured in the Wear To Now fashion blog. So doing a full-day photo shoot like this isn’t quite in Lori’s nature. "I’ve never spent the day in front of a camera and posed," she said. "It was a very pleasant surprise. I didn’t think I’d find it that easy." Lori started chemotherapy in July. And when her hair began to fall out in clumps, she shaved it all off. Her shaved head brought more attention to her ear and facial scars. "We want them to show the reality, and we want to show them the beauty in their scars," says Edyna Garcia, the blog's 25-year-old creator. 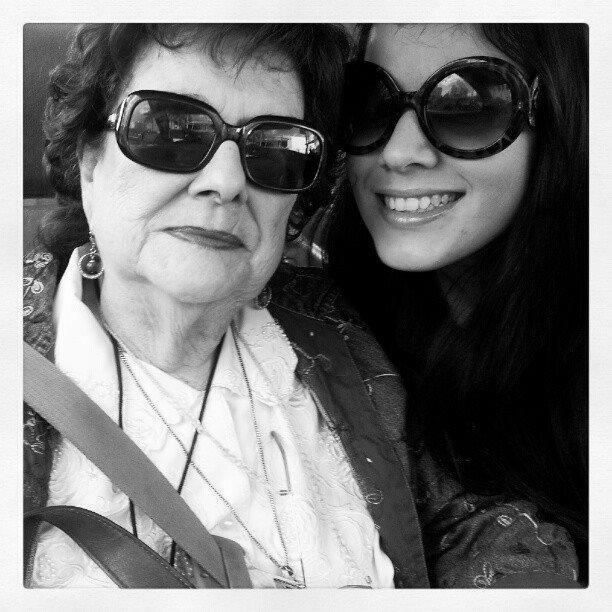 Garcia started the blog in honor of her grandmother, who died from a stomach tumor last March at 83. "She has so many traits that I aspire to have one day and if I could be somewhat like my grandmother, then I've become a really good woman," says Garcia. Her grandmother, Hada Béjar Garcia, was an actress from Cuba who loved fashion. "She was always dressed up. She was always beautiful and made-up and she always had some sort of red lipstick on," Garcia says. Hada Béjar Garcia starred in telenovelas like "Olvidarte Jamás," "Angel rebelde," "Gata salvaje" and "Guadalupe." "She was the person when I would buy something that I couldn't tell my mom I bought, I would be like, 'Grandma, look at what I bought,' and then she'd be like, 'That's awesome! Don't tell your mom either,'" Garcia remembers, laughing. Edyna Garcia, right, with her grandmother Hada Béjar Garcia, left. Garcia is a fashion stylist for the Wear To Now photo shoots and uses one piece of her grandmother’s jewelry in every shoot. She has four other women working with her: a hair stylist, makeup artist, photographer and videographer. "My entire team does this pro bono," she says. Leslie Lyn is the blog’s photographer. She also lost her grandmother to pancreatic cancer about 10 years ago. She says this blog honors her grandmother, too. "The little complaints that we have everyday -- complaining about our bills and what to wear and all those little things -- is nothing compared to what these ladies are doing, and the strength they and to have to get through this and get where they are," Leslie said. Lori Cuellar’s photoshoot wrapped up in the rainforest section of Fairchild Tropical Botanic Garden. After the shoot was done, Lori looked over the photos. "I’m not used to seeing myself baldheaded, for one thing, much less with all the makeup," Lori said. "I'm not used to seeing myself like a model." About a month ago, Lori found out she’s cancer-free. "I felt like today that I did beat cancer, that I did come out on top," Lori said. "Something that was hard for me and it can turn around and be such a beautiful experience." Garcia, the blog’s creator, says Lori’s photoshoot will debut in June. For now, she’s working on making Wear To Now a nonprofit. Eventually, Garcia wants to take the blog national, featuring men and children, too. "What I've fallen in love with the most is seeing them come to life, and that's just way better than putting an outfit together," she says. WLRN is a part of Health News Florida, which receives support from the Corporation for Public Broadcasting. Editor's note: This post follows WLRN's Kelley Mitchell's experience of taking her dog to the animal oncologist. Read the first post, When Cancer Comes Calling: The Canine Kind. Oscar, my 9-year-old Pembroke Welsh Corgi, loves to go to the vet. His Corgi brother Felix not so much. I'm not sure I really "battled" breast cancer back in 2002, as much as it battled me. But after a year of two chemotherapies, radiation and surgery, cancer and I agreed to a draw. We went back to our respective corners, both tired of this fight. You always wonder when cancer will come back. And for me, so far -- and knock on wood or formica or perhaps a granite kitchen countertop -- it hasn't. Yet, in a way I never expected, it has. In Gov. Rick Scott's budget, the Legislature approved $60 million of annual funding for three cancer centers in Florida. One of the centers, the Sylvester Comprehensive Cancer Center at the University of Miami School of Medicine, will receive $16 million per year for five years. Even before the funding the center made investments including hiring new physicians and researchers, and purchasing new equipment. As Dr. Stephen Nimer says, the new personnel and machines help make the center "world class." 10/21/13 - Monday’s Topical Currents looks at Multiple Myeloma, a rare blood disease of malignant cells found in bone marrow. We’ll visit with Dr. James Berenson, the Director and Founder of the Institute for Myeloma and Bone Cancer Research. Berenson’s Myeloma-related research can benefit all cancers where bone metastasis is a threat, particularly breast, lung and prostate cancers as well as lymphoma and leukemia. Learn more on Topical Currents Monday at 1pm.